RelativesAhl al-Bayt (“Family of the House”)SignatureSeal of MuhammadMuhammad (Arabic: محمد‎; c. ۵۷۰ – ۸ June 632), full name Abū al-Qāsim Muḥammad ibn ʿAbd Allāh ibn ʿAbd al-Muṭṭalib ibn Hāshim (ابو القاسم محمد ابن عبد الله ابن عبد المطلب ابن هاشم), from Mecca, unified Arabiainto a single religious polity under Islam. Believed by Muslims and Bahá’ís to be a messenger and prophetof God, Muhammad is almost universally[n 1] considered by Muslims as the last prophet sent by God to mankind. [n 2] While non-Muslims generally regard Muhammad as the founder of Islam, Muslims consider him to have restored the unaltered original monotheistic faith of Adam, Abraham, Moses, Jesus, and otherprophets in Islam. Muslims discuss Muhammad and other prophets of God with reverence, adding the phrase “peace be upon them” whenever their names are mentioned. Born approximately in 570 CE in the Arabian city of Mecca, Muhammad was orphaned at an early age; he was raised under the care of his paternal uncle Abu Talib. After his childhood Muhammad primarily worked as a merchant. Occasionally he would retreat to a cave in the mountains for several nights of seclusion and prayer; later, at age 40, he reported at this spot, that he was visited by Gabriel and received his first revelation from God. Three years after this event Muhammad started preaching these revelations publicly, proclaiming that “God is One”, that complete “surrender” (lit. islām) to Him is the only way (dīn)[n 3] acceptable to God, and that he was a prophet and messenger of God, similar to other Islamic prophets. Muhammad gained few followers early on, and met hostility from some Meccan tribes. To escape persecution, Muhammad sent some of his followers to Abyssinia before he and his followers in Mecca migrated to Medina (then known as Yathrib) in the year 622. This event, the Hijra, marks the beginning of the Islamic calendar, also known as the Hijri Calendar. In Medina, Muhammad united the tribes under theConstitution of Medina. After eight years of fighting with the Meccan tribes, Muhammad gathered an army of 10,000 Muslim converts and marched on the city of Mecca. The attack went largely uncontested and Muhammad took over the city with little bloodshed. He destroyed the pagan idols in the city and sent his followers out to destroy all remaining pagan temples in Eastern Arabia. In 632, a few months after returning to Medina from the Farewell Pilgrimage, Muhammad fell ill and died. Before his death, most of theArabian Peninsula had converted to Islam, and he had united Arabia into a single Muslim religious polity. The revelations (each known as Ayah, lit. “Sign [of God]”), which Muhammad reported receiving until his death, form the verses of the Quran, regarded by Muslims as the “Word of God” and around which the religion is based. Besides the Quran, Muhammad’s teachings and practices (sunnah), found in the Hadithand sira literature, are also upheld by Muslims and used as sources of Islamic law (see Sharia). While conceptions of Muhammad in medieval Christendom and other premodern contexts were largely negative, appraisals in modern history have been far more favorable. 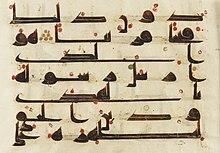 The name Muhammad written inThuluth, a script variety of Islamic calligraphy. The name Muhammad (/mʊˈhæməd, –ˈhɑːməd/) means “praiseworthy” and appears four times in the Quran. The Quran addresses Muhammad in the second person by his various appellations; prophet, messenger, servant of God (‘abd), announcer (bashir)[Quran ۲:۱۱۹], witness (shahid),[Quran ۳۳:۴۵] bearer of good tidings (mubashshir), warner (nathir),[Quran ۱۱:۲] reminder (mudhakkir),[Quran ۸۸:۲۱] one who calls [unto God] (dā‘ī),[Quran ۱۲:۱۰۸] light personified (noor)[Quran ۰۵:۱۵], and the light-giving lamp (siraj munir)[Quran ۷۳:۱]. Muhammad is sometimes addressed by designations deriving from his state at the time of the address: thus he is referred to as the enwrapped (al-muzzammil) in Quran 73:1and the shrouded (al-muddaththir) in Quran 74:1. In Sura Al-Ahzab 33:40 God singles out Muhammad as the “Seal of the Prophets”, or the last of the prophets. 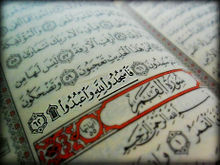 The Quran also refers to Muhammad as Aḥmad “more praiseworthy” (Arabic:أحمد‎, Sura As-Saff 61:6). Although it mentions Muhammad directly only four times,[Quran ۳:۱۴۴][Quran ۳۳:۴۰][Quran ۴۷:۲][Quran ۴۸:۲۹] there are verses which can be interpreted as allusions to Muhammad’s life. [n 4] The Quran, however, provides minimal assistance for Muhammad’s chronological biography; many of the utterances recorded in the Quran lack historical context. Next in importance are the historic works by writers of the 2nd and 3rd centuries of the Muslim era (AH – ۸th and 9th century CE). These include the traditional Muslim biographies of Muhammad (the sira literature), which provide additional information about Muhammad’s life. The earliest surviving written sira (biographies of Muhammad and quotes attributed to him) is Ibn Ishaq’s Life of God’s Messenger written c. 767 CE (150 AH). Although the work was lost, this sira was used verbatim at great length by Ibn Hisham and Al-Tabari. Another early history source is the history of Muhammad’s campaigns by al-Waqidi (death 207 of Muslim era), and the work of his secretary Ibn Sa’d al-Baghdadi (death 230 of Muslim era). Politically Arabia at the time was divided between two tribal confederations, the Banu Qais, loosely allied with Byzantium and who were originally powerful in Northern and Western Arabia, and the Banu Kalb, who had originally come from Yemen, and were loosely allied with Sassanid Persia. In pre-Islamic Arabia, gods or goddesses were viewed as protectors of individual tribes, their spirits being associated with sacred trees, stones, springs and wells. As well as being the site of an annual pilgrimage, the Kaaba shrine in Mecca housed 360 idol statues of tribal patron deities. Three goddesses were associated with Allah as his daughters: Allāt, Manāt and al-‘Uzzá. Monotheistic communities existed in Arabia, including Christians and Jews. 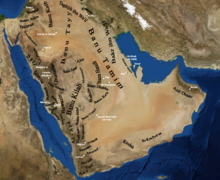 Hanifs – native pre-Islamic Arabs who “professed a rigid monotheism” – are also sometimes listed alongside Jews and Christians in pre-Islamic Arabia, although their historicity is disputed among scholars. According to Muslim tradition, Muhammad himself was a Hanif and one of the descendants of Ishmael, son of Abraham. Muhammad was born in Mecca and lived there for roughly the first 52 years of his life (c. 570–۶۲۲). This period is generally divided into two phases, before and after declaring his prophetic visions. Muhammad was born about the year 570 and his birthday is believed to be in the month of Rabi’ al-awwal. He belonged to the Banu Hashim clan, one of Mecca’s prominent families, although it appears less prosperous during Muhammad’s early lifetime. The Banu Hashim clan was part of the Quraysh tribe. Tradition places the year of Muhammad’s birth as corresponding with the Year of the Elephant, which is named after the failed destruction of Mecca that year by the Aksumite king Abraha who supplemented his army with elephants. An outbreak of smallpox among the Aksumites may explain the failure of the invading army. 20th century scholarship has suggested alternative dates for this event, such as 568 or 569. While still in his teens, Muhammad accompanied his uncle on trading journeys to Syria gaining experience in commercial trade, the only career open to Muhammad as an orphan. Islamic tradition states that when Muhammad was either nine or twelve while accompanying the Meccans’ caravan to Syria, he met a Christian monk or hermit named Bahira who is said to have foreseen Muhammad’s career as a prophet of God. Little is known of Muhammad during his later youth, and from the fragmentary information that is available, it is difficult to separate history from legend. It is known that he became a merchant and “was involved in trade between the Indian ocean and the Mediterranean Sea.” Due to his upright character he acquired the nickname “al-Amin” (Arabic: الامین), meaning “faithful, trustworthy” and “al-Sadiq” meaning “truthful” and was sought out as an impartial arbitrator.His reputation attracted a proposal in 595 from Khadijah, a 40-year-old widow. Muhammad consented to the marriage, which by all accounts was a happy one. 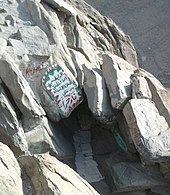 The cave Hira in the mountain Jabal al-Nourwhere, according to Muslim belief, Muhammad received his first revelation. Sahih Bukhari narrates Muhammad describing his revelations as “sometimes it is (revealed) like the ringing of a bell”. Aisha reported, “I saw the Prophet being inspired Divinely on a very cold day and noticed the sweat dropping from his forehead (as the Inspiration was over)”.According to Welch these descriptions may be considered genuine, since they are unlikely to have been forged by later Muslims. Muhammad was confident that he could distinguish his own thoughts from these messages. According to the Quran, one of the main roles of Muhammad is to warn the unbelievers of their eschatological punishment (Quran 38:70, Quran 6:19). Occasionally the Quran did not explicitly refer to Judgment day but provided examples from the history of extinct communities and warns Muhammad’s contemporaries of similar calamities (Quran 41:13–۱۶). Muhammad did not only warn those who rejected God’s revelation, but also dispensed good news for those who abandoned evil, listening to the divine words and serving God. Muhammad’s mission also involves preaching monotheism: The Quran commands Muhammad to proclaim and praise the name of his Lord and instructs him not to worship idols or associate other deities with God. According to Muslim tradition, Muhammad’s wife Khadija was the first to believe he was a prophet. She was followed by Muhammad’s ten-year-old cousin Ali ibn Abi Talib, close friend Abu Bakr, and adopted son Zaid. Around 613, Muhammad began to preach to the public (Quran 26:214). Most Meccans ignored him and mocked him, though a few became his followers. There were three main groups of early converts to Islam: younger brothers and sons of great merchants; people who had fallen out of the first rank in their tribe or failed to attain it; and the weak, mostly unprotected foreigners. The last ayah from the sura An-Najm in the Quran: “So prostrate to Allah and worship [Him].” Muhammad’s message of monotheism (one God) challenged the traditional order. According to Ibn Sad, the opposition in Mecca started when Muhammad delivered verses that condemned idol worship and the Meccan forefathers who engaged in polytheism. However, the Quranic exegesis maintains that it began as Muhammad started public preaching. As the number of followers increased, he became a threat to the local tribes and rulers of the city, whose wealth rested upon the Ka’aba, the focal point of Meccan religious life that Muhammad threatened to overthrow. Muhammad’s denunciation of the Meccan traditional religion was especially offensive to his own tribe, theQuraysh, as they were the guardians of the Ka’aba. The powerful merchants attempted to convince Muhammad to abandon his preaching by offering him admission into the inner circle of merchants, and establishing his position therein by an advantageous marriage. However, he refused both. In 615, some of Muhammad’s followers emigrated to the Ethiopian Aksumite Empire and founded a small colony under the protection of the Christian Ethiopian emperor Aṣḥama ibn Abjar. Ibn Sa’ad mentions two separate migrations. According to him, most of the Muslims returned to Mecca prior to Hijra, while there was a second group that rejoined them in Medina. Ibn Hisham and Tabari, however, only talk about one migration to Ethiopia. These accounts agree that persecution in Mecca played a major role in Muḥammad’s decision to suggest that a number of his followers seek refuge among the Christians in Abyssinia. According to the famous letter of ʿUrwa preserved in al-Tabari, the majority of Muslims returned to their native town after Islam had become strengthened when high rank people in Mecca, such as Umar and Hamzah converted. However, there is a complete different story on the reason why the Muslims returned from Ethiopia to Mecca. According to this account -that has been mentioned by Tabari, Ibn Sa’ad and Al-Waqidi, but not by Ibn Hisham and perhaps not by Ibn Ishaq- Muhammad, desperately hoping for an accommodation with his tribe, pronounced a verse acknowledging the existence of three Meccan goddesses considered to be the daughters of Allah. Muhammad retracted the verses the next day at the behest of Gabriel, claiming that the verses were whispered by the devil himself. Instead, a ridicule of these gods was offered. [n 5][n 6] This episode known as “The Story of the Cranes” (translation: قصه الغرانیق, transliteration: Qissat al Gharaneeq) is also known as “Satanic Verses”. According to the story this led to a general reconciliation between Muḥammad and the Meccans, and the Muslims who had migrated to Abyssinia began to return home. By the time they arrived, however, the archangel Gabriel had informed Muḥammad that the two g̲h̲arānīḳ verses were not part of the revelation, but had been inserted by Satan. Some scholars argued against the historic authenticity of these verses on various grounds. [n 7] Later the incident received widespread acceptance, however strong objections to it were raised starting from the 10th century, on theological grounds. The objections continued on this point until rejection of these verses eventually became the only acceptable orthodox Muslim position. The Al-Aqsa Mosque, part of the al-Haram ash-Sharif complex inJerusalem, is believed to be the “farthest mosque” to which Muhammad travelled in his night journey. The al-Haram ash-Sharif is the third holiest place on earth for Muslims. Islamic tradition states that in 620, Muhammad experienced the Isra and Mi’raj, a miraculous journey said to have occurred with the angel Gabriel in one night. 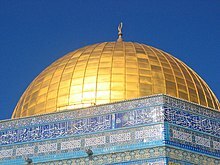 In the beginning of the journey, the Isra, he is said to have travelled from Mecca on awinged steed (Buraq) to “the farthest mosque” (in Arabic: masjid al-aqsa), which Muslims usually identify with the Al-Aqsa Mosque in Jerusalem. Later, during the Mi’raj, Muhammad is said to have toured heaven and hell, and spoke with earlier prophets, such as Abraham, Moses, and Jesus. Ibn Ishaq, author of the first biography of Muhammad, presents the event as a spiritual experience; later historians, like Al-Tabari and Ibn Kathir, present it as a physical journey. Muhammad’s wife Khadijah and uncle Abu Talib both died in 619, the year thus being known as the “year of sorrow”. With the death of Abu Talib, leadership of the Banu Hashim clan passed to Abu Lahab, a tenacious enemy of Muhammad. Soon afterwards, Abu Lahab withdrew the clan’s protection over Muhammad. This placed Muhammad in danger; the withdrawal of clan protection implied that blood revenge for his killing would not be exacted. Muhammad then visited Ta’if, another important city in Arabia, and tried to find a protector, but his effort failed and further brought him into physical danger. Muhammad was forced to return to Mecca. A Meccan man named Mut’im ibn Adi (and the protection of the tribe of Banu Nawfal) made it possible for him to safely re-enter his native city. Many people were visiting Mecca on business or as pilgrims to the Kaaba. Muhammad took this opportunity to look for a new home for himself and his followers. After several unsuccessful negotiations, he found hope with some men from Yathrib (later called Medina). The Arab population of Yathrib were familiar with monotheism and were prepared for the appearance of a prophet because a Jewish community existed there. They also hoped, by the means of Muhammad and the new faith, to gain supremacy over Mecca; the Yathrib were jealous of its importance as the place of pilgrimage. Converts to Islam came from nearly all Arab tribes in Medina; by June of the subsequent year, seventy-five Muslims came to Mecca for pilgrimage and to meet Muhammad. Meeting him secretly by night, the group made what is known as the “Second Pledge of al-`Aqaba“, or, in Orientalists’ view, the “Pledge of War“. Following the pledges at Aqabah, Muhammad encouraged his followers to emigrate to Yathrib. As with the migration to Abyssinia, the Quraysh attempted to stop the emigration. However, almost all Muslims managed to leave. The Hijra is the migration of Muhammad and his followers from Mecca to Medina in 622 CE. In June 622, warned of a plot to assassinate him, Muhammad secretly slipped out of Mecca and moved his followers to Medina, 320 kilometres (200 miles) north of Mecca. A delegation, consisting of the representatives of the twelve important clans of Medina, invited Muhammad to serve as chief arbitrator for the entire community; due to his status as a neutral outsider. There was fighting in Yathrib: primarily the dispute involved its Arab and Jewish inhabitants, and was estimated to have lasted for around a hundred years before 620. The recurring slaughters and disagreements over the resulting claims, especially after the Battle of Bu’ath in which all clans were involved, made it obvious to them that the tribal concept of blood-feud and an eye for an eye were no longer workable unless there was one man with authority to adjudicate in disputed cases. The delegation from Medina pledged themselves and their fellow-citizens to accept Muhammad into their community and physically protect him as one of themselves. Muhammad instructed his followers to emigrate to Medina, until nearly all his followers left Mecca. Being alarmed at the departure, according to tradition, the Meccans plotted to assassinate Muhammad. With the help of Ali, Muhammad fooled the Meccans watching him, and secretly slipped away from the town with Abu Bakr. By 622, Muhammad emigrated to Medina, a large agricultural oasis. Those who migrated from Mecca along with Muhammad became known asmuhajirun (emigrants). Among the first things Muhammad did to ease the longstanding grievances among the tribes of Medina was to draft a document known as the Constitution of Medina, “establishing a kind of alliance or federation” among the eight Medinan tribes and Muslim emigrants from Mecca; this specified rights and duties of all citizens, and the relationship of the different communities in Medina (including the Muslim community to other communities, specifically the Jews and other “Peoples of the Book”). The community defined in the Constitution of Medina, Ummah, had a religious outlook, also shaped by practical considerations and substantially preserved the legal forms of the old Arab tribes. The first group of converts to Islam in Medina were the clans without great leaders; these clans had been subjugated by hostile leaders from outside. This was followed by the general acceptance of Islam by the pagan population of Medina, with some exceptions. According to Ibn Ishaq, this was influenced by the conversion of Sa’d ibn Mu’adh (a prominent Medinan leader) to Islam. Medinans who converted to Islam and helped the Muslim emigrants find shelter became known as the ansar (supporters). Then Muhammad instituted brotherhood between the emigrants and the supporters and he chose Ali as his own brother. the “Throne Verse” (2:255), revealed in Medina. Following the emigration, the people of Mecca seized property of Muslim emigrants to Mecca.Economically uprooted with no available profession, the Muslim migrants turned to raiding Meccan caravans, initiating armed conflict with Mecca.Muhammad delivered Quranic verses permitting Muslims to fight the Meccans (see sura Al-Hajj, Quran22:39–۴۰). These attacks allowed the migrants to acquire wealth, power and prestige while working towards the ultimate goal of conquering Mecca. According to the traditional account, on 11 February 624, while praying in the Masjid al-Qiblatain in Medina, Muhammad received revelations from God that he should be facing Mecca rather than Jerusalem during prayer. Muhammad adjusted to the new direction, and his companions praying with him followed his lead, beginning the tradition of facing Mecca during prayer. According to Watt, the change may have been less sudden and definite than the story suggests – the related Quranic verses (2:136–۲:۱۴۷) appear to have been revealed at different times – and correlates with changes in Muhammad’s political support base, symbolizing his turning away from Jews and adopting a more Arabian outlook. In March 624, Muhammad led some three hundred warriors in a raid on a Meccan merchant caravan. The Muslims set an ambush for the caravan at Badr.Aware of the plan, the Meccan caravan eluded the Muslims. A force from Mecca was sent to protect the caravan, and continued en route to confront the Muslims upon receiving word that the caravan was safe. The Battle of Badr commenced. Though outnumbered more than three to one, the Muslims won the battle, killing at least forty-five Meccans with fourteen Muslims dead. They also succeeded in killing many Meccan leaders, including Abu Jahl. Seventy prisoners had been acquired, many of whom were ransomed in return for wealth or freed. Muhammad and his followers saw the victory as confirmation of their faith and Muhammad ascribed the victory as assisted from an invisible host of angels. The Quranic verses of this period,[which?] unlike the Meccan verses, dealt with practical problems of government and issues like the distribution of spoils. The victory strengthened Muhammad’s position in Medina and dispelled earlier doubts among his followers. As a result the opposition to him became less vocal. Pagans who had not yet converted were very bitter about the advance of Islam. Two pagans, Asma bint Marwan of the Aws Manat tribe and Abu ‘Afak of the ‘Amr b. ‘Awf tribe, had composed verses taunting and insulting the Muslims. They were killed by people belonging to their own or related clans, and Muhammad did not disapprove the killings. Most members of those tribes converted to Islam and there was hardly any opposition from the pagans left. Muhammad expelled from Medina the Banu Qaynuqa, one of three main Jewish tribes, but some historians contend that the expulsion happened after Muhammad’s death. According to al-Waqidi, after Abd-Allah ibn Ubaiy spoke for them, Muhammad refrained from executing them and commanded that they be exiled from Medina. Following the Battle of Badr, Muhammad also made mutual-aid alliances with a number of Bedouin tribes to protect his community from attacks from the northern part of Hejaz. The Kaaba in Mecca long held a major economic and religious role for the area. Seventeen months after Muhammad’s arrival in Medina, it became the Muslim Qibla, or direction for prayer (salat). The Kaaba has been rebuilt several times; the present structure, built in 1629, is a reconstruction of an earlier building dating to 683. The Meccans were eager to avenge their defeat. To maintain economic prosperity, the Meccans needed to restore their prestige, which had been reduced at Badr. In the ensuing months, the Meccans sent ambush parties to Medina while Muhammad led expeditions against tribes allied with Mecca and sent raiders onto a Meccan caravan. Abu Sufyangathered an army of three thousand men and set out for an attack on Medina. A scout alerted Muhammad of the Meccan army’s presence and numbers a day later. The next morning, at the Muslim conference of war, dispute arose over how best to repel the Meccans. Muhammad and many senior figures suggested it would be safer to fight within Medina and take advantage of the heavily fortified strongholds. Younger Muslims argued that the Meccans were destroying crops, and huddling in the strongholds would destroy Muslim prestige. Muhammad eventually conceded to the younger Muslims and readied the Muslim force for battle. Muhammad led his force outside to the mountain of Uhud (the location of the Meccans camp) and fought the Battle of Uhud on 23 March. Although the Muslim army had the advantage in early encounters, lack of discipline on the part of strategically placed archers led to a Muslim defeat; 75 Muslims were killed including Hamza, Muhammad’s uncle who became one of the best known martyrs in the Muslim tradition. The Meccans did not pursue the Muslims, instead they marched back to Mecca declaring victory. The announcement is probably because Muhammad was wounded and thought dead. When they discovered that Muhammad lived, the Meccans did not return due to false information about new forces coming to his aid. The attack had failed to achieve their aim of completely destroying the Muslims. The Muslims buried the dead, and returned to Medina that evening. Questions accumulated about the reasons for the loss; Muhammad delivered Quranic verses 3:152 indicating that the defeat was twofold: partly a punishment for disobedience, partly a test for steadfastness. Abu Sufyan directed his effort towards another attack on Medina. 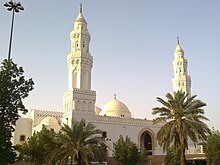 He gained support from the nomadic tribes to the north and east of Medina; using propaganda about Muhammad’s weakness, promises of booty, memories of Quraysh prestige and through bribery. Muhammad’s new policy was to prevent alliances against him. Whenever alliances against Medina were formed, he sent out expeditions to break them up. Muhammad heard of men massing with hostile intentions against Medina, and reacted in a severe manner. One example is the assassination of Ka’b ibn al-Ashraf, a chieftain of the Jewish tribe of Banu Nadir. al-Ashraf went to Mecca and wrote poems that roused the Meccans’ grief, anger and desire for revenge after the Battle of Badr. Around a year later, Muhammad expelled the Banu Nadir from Medinaforcing their emigration to Syria; he allowed them to take some possessions, as he was unable to subdue the Banu Nadir in their strongholds. The rest of their property was claimed by Muhammad in the name of God as it was not gained with bloodshed. Muhammad surprised various Arab tribes, individually, with overwhelming force, causing his enemies to unite to annihilate him. Muhammad’s attempts to prevent a confederation against him were unsuccessful, though he was able to increase his own forces and stopped many potential tribes from joining his enemies. With the help of the exiled Banu Nadir, the Quraysh military leader Abu Sufyan mustered a force of 10,000 men. Muhammad prepared a force of about 3,000 men and adopted a form of defense unknown in Arabia at that time; the Muslims dug a trench wherever Medina lay open to cavalry attack. The idea is credited to a Persian convert to Islam, Salman the Persian. The siege of Medina began on 31 March 627 and lasted two weeks. Abu Sufyan’s troops were unprepared for the fortifications, and after an ineffectual siege, the coalition decided to return home. The Quran discusses this battle in sura Al-Ahzab, in verses 33:9–۲۷٫ During the battle, the Jewish tribe of Banu Qurayza, located the south of Medina, entered into negotiations with Meccan forces to revolt against Muhammad. Although the Meccan forces were swayed by suggestions that Muhammad was sure to be overwhelmed, they desired reassurance in case the confederacy was unable to destroy him. No agreement was reached after prolonged negotiations, partly due to sabotage attempts by Muhammad’s scouts.After the coalition’s retreat, the Muslims accused the Banu Qurayza of treachery and besieged them in their forts for 25 days. The Banu Qurayza eventually surrendered; according to Ibn Ishaq, all the men apart from a few converts to Islam were beheaded, while the women and children were enslaved. Walid N. Arafat and Barakat Ahmad have disputed the accuracy of Ibn Ishaq’s narrative. Arafat believes that Ibn Ishaq’s Jewish sources, speaking over 100 years after the event, conflated this account with memories of earlier massacres in Jewish history; he notes that Ibn Ishaq was considered an unreliable historian by his contemporary Malik ibn Anas, and a transmitter of “odd tales” by the later Ibn Hajar. Ahmad argues that only some of the tribe was killed, while some of the fighters were merely enslaved. Watt finds Arafat’s arguments “not entirely convincing”, while Meir J. Kister has contradicted[clarification needed] the arguments of Arafat and Ahmad. In the siege of Medina, the Meccans exerted the available strength to destroy the Muslim community. The failure resulted in a significant loss of prestige; their trade with Syria vanished. Following the Battle of the Trench, Muhammad made two expeditions to the north, both ended without any fighting. While returning from one of these journeys (or some years earlier according to other early accounts), an accusation of adultery was made against Aisha, Muhammad’s wife. Aisha was exonerated from accusations when Muhammad announced he had received a revelation confirming Aisha’s innocence and directing that charges of adultery be supported by four eyewitnesses (sura 24, An-Nur). Although Muhammad had delivered Quranic verses commanding the Hajj, the Muslims had not performed it due to Quraysh enmity. In the month of Shawwal628, Muhammad ordered his followers to obtain sacrificial animals and to prepare for a pilgrimage (umrah) to Mecca, saying that God had promised him the fulfillment of this goal in a vision when he was shaving his head after completion of the Hajj. Upon hearing of the approaching 1,400 Muslims, the Quraysh dispatched 200 cavalry to halt them. Muhammad evaded them by taking a more difficult route, enabling his followers to reach al-Hudaybiyya just outside of Mecca. According to Watt, although Muhammad’s decision to make the pilgrimage was based on his dream, he was also demonstrating to the pagan Meccans that Islam did not threaten the sanctuaries prestige, that Islam was an Arabian religion. Negotiations commenced with emissaries travelling to and from Mecca. While these continued, rumors spread that one of the Muslim negotiators, Uthman bin al-Affan, had been killed by the Quraysh. Muhammad called upon the pilgrims to make a pledge not to flee (or to stick with Muhammad, whatever decision he made) if the situation descended into war with Mecca. This pledge became known as the “Pledge of Acceptance” (Arabic: بیعه الرضوان , bay’at al-ridhwān‎) or the “Pledge under the Tree”. News of Uthman’s safety allowed for negotiations to continue, and a treaty scheduled to last ten years was eventually signed between the Muslims and Quraysh. The main points of the treaty included: cessation of hostilities, the deferral of Muhammad’s pilgrimage to the following year, and agreement to send back any Meccan who emigrated to Medina without permission from their protector. Many Muslims were not satisfied with the treaty. However, the Quranic sura “Al-Fath” (The Victory) (Quran 48:1–۲۹) assured them that the expedition must be considered a victorious one. It was later that Muhammad’s followers realized the benefit behind the treaty. These benefits included the requirement of the Meccans to identify Muhammad as an equal, cessation of military activity allowing Medina to gain strength, and the admiration of Meccans who were impressed by the pilgrimage rituals. After signing the truce, Muhammad assembled an expedition against the Jewish oasis of Khaybar, known as the Battle of Khaybar. This was possibly due to housing the Banu Nadir who were inciting hostilities against Muhammad, or to regain prestige from what appeared as the inconclusive result of the truce of Hudaybiyya. According to Muslim tradition, Muhammad also sent letters to many rulers, asking them to convert to Islam (the exact date is given variously in the sources). He sent messengers (with letters) to Heraclius of the Byzantine Empire (the eastern Roman Empire), Khosrau of Persia, the chief ofYemen and to some others. In the years following the truce of Hudaybiyya, Muhammad directed his forces against the Arabs on TransjordanianByzantine soil in the Battle of Mu’tah, in which the Muslims were defeated. 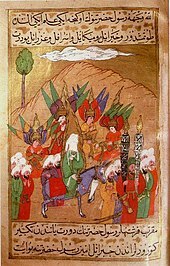 A depiction of Muhammad (with veiled face) advancing on Mecca from Siyer-i Nebi, a 16th-century Ottomanmanuscript. The angels Gabriel, Michael, Israfil and Azrail, are also shown. The truce of Hudaybiyyah had been enforced for two years. The tribe of Banu Khuza’a had good relations with Muhammad, whereas their enemies, the Banu Bakr, had allied with the Meccans. A clan of the Bakr made a night raid against the Khuza’a, killing a few of them. The Meccans helped the Banu Bakr with weapons and, according to some sources, a few Meccans also took part in the fighting. After this event, Muhammad sent a message to Mecca with three conditions, asking them to accept one of them. These were: either the Meccans would pay blood money for the slain among the Khuza’ah tribe, they disavow themselves of the Banu Bakr, or they should declare the truce of Hudaybiyyah null. Muhammad began to prepare for a campaign. In 630, Muhammad marched on Mecca with 10,000 Muslim converts. With minimal casualties, Muhammad seized control of Mecca. He declared an amnesty for past offences, except for ten men and women who were “guilty of murder or other offences or had sparked off the war and disrupted the peace”. Some of these were later pardoned. Most Meccans converted to Islam and Muhammad proceeded to destroy all the statues of Arabian gods in and around the Kaaba. According to reports collected by Ibn Ishaq and al-Azraqi, Muhammad personally spared paintings or frescos of Mary and Jesus, but other traditions suggest that all pictures were erased. The Quran discusses the conquest of Mecca. Following the conquest of Mecca, Muhammad was alarmed by a military threat from the confederate tribes of Hawazin who were raising an army twice Muhammad’s size. The Banu Hawazin were old enemies of the Meccans. They were joined by the Banu Thaqif (inhabiting the city of Ta’if) who adopted an anti-Meccan policy due to the decline of the prestige of Meccans. Muhammad defeated the Hawazin and Thaqif tribes in the Battle of Hunayn. In the same year, Muhammad organized an attack against northern Arabia because of their previous defeat at the Battle of Mu’tah and reports of hostility adopted against Muslims. With great difficulty he assembled thirty thousand men; half of whom on the second day returned with Abd-Allah ibn Ubayy, untroubled by the damning verses which Muhammad hurled at them. Although Muhammad did not engage with hostile forces at Tabuk, he received the submission of some local chiefs of the region. He also ordered destruction of any remaining pagan idols in Eastern Arabia. The last city to hold out against the Muslims in Western Arabia was Taif. Muhammad refused to accept the city’s surrender until they agreed to convert to Islam and allowed men to destroy the statue of their goddess Allat. Anonymous illustration of al-Bīrūnī’sThe Remaining Signs of Past Centuries, depicting Muhammadprohibiting Nasi’ during the Farewell Pilgrimage, 17th century Ottoman copy of a 14th-century (Ilkhanate) manuscript (Edinburgh codex). In 632, at the end of the tenth year after migration to Medina, Muhammad completed his first truly Islamic pilgrimage, thereby teaching his followers the rites of the annual Great Pilgrimage, known as Hajj. After completing the pilgrimage, Muhammad delivered a famous speech, known as the Farewell Sermon, at Mount Arafat east of Mecca. In this sermon, Muhammad advised his followers not to follow certain pre-Islamic customs. Also a white has no superiority over black, nor a black has any superiority over white except by piety and good action. He abolished old blood feuds and disputes based on the former tribal system and asked for old pledges to be returned as implications of the creation of the new Islamic community. Commenting on the vulnerability of women in his society, Muhammad asked his male followers to “be good to women, for they are powerless captives (awan) in your households. You took them in God’s trust, and legitimated your sexual relations with the Word of God, so come to your senses people, and hear my words …” He told them that they were entitled to discipline their wives but should do so with kindness. He addressed the issue of inheritance by forbidding false claims of paternity or of a client relationship to the deceased, and forbade his followers to leave their wealth to a testamentary heir. He also upheld the sacredness of four lunar months in each year. According to Sunni tafsir, the following Quranic verse was delivered during this event: “Today I have perfected your religion, and completed my favours for you and chosen Islam as a religion for you” (Quran 5:3). According to Shia tafsir, it refers to the appointment of Ali ibn Abi Talib at the pond of Khumm as Muhammad’s successor, this occurring a few days later when Muslims were returning from Mecca to Medina. He was buried where he died in Aisha’s house. During the reign of the Umayyad caliph al-Walid I, the Al-Masjid al-Nabawi (the Mosque of the Prophet) was expanded to include the site of Muhammad’s tomb. The Green Dome above the tomb was built by the Mamluk sultan Al Mansur Qalawun in the 13th century, although the green color was added in the 16th century, under the reign of Ottoman sultan Suleiman the Magnificent. Among tombs adjacent to that of Muhammad are those of his companions (Sahabah), the first two Muslim caliphs Abu Bakr and Umar, and an empty one that Muslims believe awaits Jesus. When bin Saud took Medina in 1805, Muhammad’s tomb was stripped of its gold and jewel ornaments.Adherents to Wahhabism, bin Sauds’ followers destroyed nearly every tomb dome in Medina in order to prevent their veneration,and the one of Muhammad is said to have narrowly escaped. Similar events took place in 1925 when the Saudi militias retook—and this time managed to keep—the city. In the Wahhabi interpretation of Islam, burial is to take place in unmarked graves. Although frowned upon by the Saudis, many pilgrims continue to practice a ziyarat—a ritual visit—to the tomb. Although banned by the Saudis, the first photos from inside of the tomb of Muhammad and his daughter’s (Fatemeh) house were published in October 2012 demonstrating a very simple construction, decorated in green. Al-Masjid an-Nabawi (the Mosque of the Prophet) in Medina, Saudi Arabia, with the Green Dome built over Muhammad’s tomb in the center. Muhammad united the tribes of Arabia into a single Arab Muslim religious polity in the last years of his life. With Muhammad’s death, disagreement broke out over who his successor would be. Umar ibn al-Khattab, a prominent companion of Muhammad, nominated Abu Bakr, Muhammad’s friend and collaborator. With additional support Abu Bakr was confirmed as the first caliph. This choice was disputed by some of Muhammad’s companions, who held that Ali ibn Abi Talib, his cousin and son-in-law, had been designated the successor by Muhammad at Ghadir Khumm. Abu Bakr’s immediately moved to strike against the Byzantine (or Eastern Roman Empire) forces because of the previous defeat, although he first had to put down a rebellion by Arab tribes in an event that Muslim historians later referred to as the Ridda wars, or “Wars of Apostasy”. The pre-Islamic Middle East was dominated by the Byzantine and Sassanian empires. The Roman-Persian Wars between the two had devastated the region, making the empires unpopular amongst local tribes. Furthermore, in the lands that would be conquered by Muslims many Christians (Nestorians, Monophysites, Jacobites and Copts) were disaffected from theChristian Orthodoxy which deemed them heretics. Within a decade Muslims conquered Mesopotamia, Byzantine Syria, Byzantine Egypt, large parts of Persia, and established the Rashidun Caliphate. According to William Montgomery Watt religion, for Muhammad, was not a private and individual matter but “the total response of his personality to the total situation in which he found himself. He was responding [not only]… to the religious and intellectual aspects of the situation but also to the economic, social, and political pressures to which contemporary Mecca was subject.” Bernard Lewis says there are two important political traditions in Islam – Muhammad as a statesman in Medina, and Muhammad as a rebel in Mecca. His view believed Islam as a great change, akin to a revolution, when introduced to new societies. Historians generally agree that Islamic social changes in areas such as social security, family structure, slavery and the rights of women and children improved on the status quo of Arab society. For example, according to Lewis, Islam “from the first denounced aristocratic privilege, rejected hierarchy, and adopted a formula of the career open to the talents”.[which?] Muhammad’s message transformed society and moral orders of life in the Arabian Peninsula; society focused on the changes to perceived identity, world view, and the hierarchy of values. [page needed] Economic reforms addressed the plight of the poor, which was becoming an issue in pre-Islamic Mecca. The Quran requires payment of an alms tax (zakat) for the benefit of the poor; as Muhammad’s power grew he demanded that tribes who wished to ally with him implement the zakat in particular.